Find out more about Paul Huljich at http://www.paulhuljich.com/. Huljich founded Best Corporation in 1985 to develop food products in Australia, investing resources into research and development for organic foods. He was the first to do this. He shares his opinion on genetically modified foods. Huljich believes it’s extremely important to survive through tough times naturally rather than through drugs. He shares some natural steps to become aware of the stressors in life and some empowering techniques to minimize harmful health effects. Jason Hartman: It’s my pleasure to welcome Paul Huljich to the show. He is the cofounder, chairman and joint CEO of Best Corporation. He’s an organic food pioneer and author of Stress Pandemic: Nine Natural Steps to Survive, Master Stress and Live Well. And he’s just got a beautiful website and some very interesting takes on stress. Paul welcome, how are you? Paul Huljich: I’m very good, thank you Jason. And thank you for the opportunity to be on your show and reach out to you listeners. Jason Hartman: Well, we’re glad to have you. You’re from Australia, I take it, and today you’re in Boston right? Paul Huljich: That’s right. I’m on tour throughout the United States, and for the last three years I’ve been living on the granite rock in New York City, and that’s where I wrote Stress Pandemic. I wanted to be right in amongst the intensity of living in a very much 24-7 environment. Jason Hartman: Well New York City is the place to do it, that’s for sure. If you can’t get stressed out in New York City, you can’t get stressed out anywhere. Just before we start, where are you from in Australia? Paul Huljich: Well, I’m actually from New Zealand. I’ve lived in Australia in a lodge in Sydney. But I was actually born in New Zealand in Auckland. Jason Hartman: Oh, been there and been to Australia. Both very beautiful places. Paul Huljich: Well thank you. Jason Hartman: Good stuff. Well, tell us a little bit about how you came to write Stress Pandemic if you would. Paul Huljich: Well, it’s a bit of a story that what happened was I bought into the Hollywood dream as work hard and actually make myself a big success and be my own boss, and live in a safe neighborhood and drive a great car. So I worked very hard, and at the age of about 40 I thought I had the perfect life. I was the chairman CEO of the multimillion dollar pioneering organic food company that was listed on the stock exchange, and I had just built the people I love most a grand mansion, and of course I had the Porsche parked in the driveway. But due to stress and making poor lifestyle choices, I lost everything, most of all my freedom. I had a complete mental breakdown and they confiscated my passports and took my credit cards off me and froze my bank accounts and I was made a ward of the state. And I was told that due to stress, and I had some symptoms of stress… mine were initially just grinding of my teeth, having insomnia and having a little bit of a dull feeling in my tummy, which I found out later was that I had a bit of depression. From there I developed severe depression where I was lying in the fetal position in bed in total darkness feeling unloved and afraid of the world. And to even get out of bed was a huge effort. To be able to make a decision what to wear or what to eat was huge. I just couldn’t make that decision. Jason Hartman: That is really terrible and amazing. But I’ve got to ask you Paul before you go on, how did they take your possessions away? The state did this, I assume. And was this in New Zealand or Australia, first of all? And what happened to bring that about. I know the symptoms you mentioned, but many people have symptoms like this. That’s not a reason to make you a ward of the state. Paul Huljich: For me, I developed bizarre behavior from severe depression. And I became a runaway train – I lost control totally. I would go into a restaurant and couldn’t speak when they asked me what would I like. I almost stripped to my underpants in a board meeting. Close to the time of having my nervous breakdown, I actually was giving out hundred dollar bills at the local gas station. And I thought I could fly. I was jumping off high walls, to the shock of my wife and my sons – my feet were all bloody. It got very, very scary for everyone. And then I totally lost it. I thought I could walk on water, and it was pretty bad. And a lot of what happened when I had my complete mental breakdown, I cannot remember to this day. And this happens in any country. This happened in New Zealand. It happens here in America, it happens in Australia. It happens throughout the world. There are laws whereby if you’re a danger to yourself or to society they can take away your rights as a citizen, and that happens everywhere. Jason Hartman: Okay, I didn’t know that it was that serious. Paul Huljich: Well the thing is everybody can say, well I’d never go near that tipping point. Well, none of us know where that tipping point is until it’s too late. By the time that you find that you’re losing control of your sanity, it’s too late. It’s like walking into quick sand. You don’t realize until you’re in the quick sand and the more you struggle, the more you go down. So after I had the mental breakdown, and I was told there was no cure because I’d developed Bipolar Disorder, and due to stress I developed Bipolar Disorder. Never had it before in my life, but I had it then. And I had a very serious condition of it, what they call today Bipolar 1. And that’s the end of the road, either that or you end up committing suicide. That’s what happens to a lot of people. They have a complete mental breakdown. You can become very suicidal. So from there I decided to fight back because they said there’s no cure, and I’m going to relapse and go through all that again another time. And that’s going to happen over my lifetime. And I thought, well I’m going to fight back. I’m going to find a cure. There’s got to be a cure. So I traveled to the ward The Mayo Clinic of Rochester, Minnesota. And there I went under many physical and emotional tests for about two weeks, and again they told me there’s no cure. So I sit and look, and this is the head of the psychiatric department, and I said well, where would you send me if I was your son or your brother? I’d like to go somewhere where I can find answers and learn a lot more about depression, anxiety, addictions, and find answers to how I can fight back and be much better. And they said, well there’s no cure, but if I was you I’d go to the Menninger Clinic in Topeka, Kansas. So that’s where I went. And I admitted myself, whereby I couldn’t get myself out. My wife couldn’t, my children couldn’t, my mother, my brothers, no one could. And I couldn’t get myself out without the approval of the doctors. So there I studied everything about addiction, sadness, guilt, anger, depression, anxiety, bipolar disorder, everything you could imagine. And when I left, I was a bit unmoved by it all because I’d gained a lot of knowledge, I had befriended every patient, went to all the different classes to learn as much as I could, and learned about people’s lives; what medication are they on, what addictions, what had happened in their lives, and had they been here before? And that was the scary part. It was like a revolving door. Some of the patients were doctors, lawyers, successful business people, people from all walks of life. Jason Hartman: You know Paul, it’s pretty interesting, unfortunate of course, but it’s interesting that you were running an organic food company, and it seemed to indicate that you would be thinking about health and wellness and all of these things, and this still happened to you. Paul Huljich: Yes, I was. Well that is a very good point, Jason. I had an amazing team around me. I had a trainer, I was doing yoga, I was doing meditation, I was running up to a mile a day. I was doing life with all the right things, but as I said to my psychiatrists and my doctors, why am I getting worse? Why are my symptoms of stress not abating, but they’re actually getting worse? And that’s what’s happening with a lot of us. We have symptoms of stress like grinding the teeth or insomnia, fatigue, allergies, depression, anxiety, and what can happen is that they can develop into more serious issues like diabetes, cancer, stroke, heart disease, or a serious mind condition. And mine developed into a serious mind condition. Why? I didn’t understand what was happening to me on a neurochemical basis, to my mind. It was actually accelerating and getting worse. And that happens to a lot of people. Stress causes you to develop serious mind conditions and addictions to countless stress; that is your destructive coping mechanisms that you lean on as I call leaning on your crutches when you feel most stressed and vulnerable. Jason Hartman: Very good points. Well, in The Stress Pandemic, you talk about these nine steps. What are those real quickly, if you could kind of just label those for us, and then I’ve got some other questions about genetically modified foods. I want to get into that topic as well. Paul Huljich: Okay. Well, what has happened is these nine natural steps, and you don’t have to do them all at once. You can do them one at a time. But they’re small practical steps, but ones that can help make a huge difference. You don’t have to take my word for it. The Stress Institute did a review on the book and said that it’s a great guidebook, well researched and scientifically proven. And you only need to go to StressPandemic.com and you’ll see the reviews and a whole world of information will come and open up to you. But it’s all about helping you to be able to say no to stress. It’s about helping to fortify you against the stresses and challenges of life. It can help you take charge and be able to learn to say no, knowing that the world is a bit of a boring place. And help you to kick your bad habits. And a lot of us have bad habits. My bad habit was CRAP, standing for caffeine, refined sugar, alcohol and processed foods. And it helps you to identify with good mood foods, and it actually also helps you to understand more about the nutrition and that you’ve got a second brain that’s right in your gut and your small intestine. Actually 95% of the serotonin receptors are. So if you’re eating a lot of crap, you need to try and cut down on it and have it in strict moderation, and start diving into good mood foods. That will help you sleep. I talk a lot about how one of the steps is all about sleep; understanding that if you enter crap, you get an artificial serotonin high, because you get a dopamine highjack. Dopamine is your reward pleasure center and it craves more. So the more crap you have, the more you’ll want to over time have more. And it becomes addictive. Think of famous people like Elvis Presley, Michael Jackson, Karen Carpenter, even recently Whitney Houston. They had everything. They shouldn’t have stress. They had wealth, fame, success, but look what happened to them. You see destructive coping mechanisms that kept pulling them down and shortening lives. So you’re not alone. So the other steps are all about affirmations, exercise; some people might not be aware there’s 7,200 nerve endings in your feet connected to every part of the brain and the body so taking a brisk walk without interruptions helps balance the neurochemistry of the brain and the body and fortifies you against the stresses and challenges of life. And then you’ve got the other steps helping guide you. It’s a roadmap to wellness. It’s a roadmap to fortifying yourself against stress. It’s about awareness – awareness of your lifestyle. According to the World Health Organization, lifestyle diseases are the greatest cause of death on this planet. So if you have an awareness of your lifestyle and start just looking at how you live, it’s a big step in fighting back against stress. And The Stress Pandemic helps guide you. It’s a roadmap also to happiness and feeling in control. Because a lot of us have lost control of our lives, and it also helps you to never give up. As Winston Churchill said, “We’ll never give up.” So it’s like a child learning to walk; no matter how many times a child falls over, they keep trying. Jason Hartman: Absolutely. Well, tell us your thoughts on the genetically modified food thing is such a big deal nowadays. Everybody is talking about it. Thankfully it’s in the forefront, well I don’t want to say the forefront of the news, but it’s certainly popular as an online topic in social media. I would probably say the mainstream news is probably avoiding the issue because look who sponsors the mainstream news, right? Big advertising support from Monsanto, etc. but tell us your thoughts about genetically modified food. 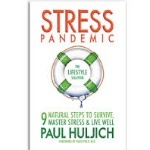 Paul Huljich: Well, I mention them briefly in Stress Pandemic. They’re not good for you. And the truth will come out in the long term. It’s very sad, but it’s not good for us. Jason Hartman: Well, how do you know that though? That’s one of the things that I think people have trouble making a case. Paul Huljich: I think that there have been tests. A lot of people have done tests on animals that are eating engineered food different in temperament and very upset, and they’ve had to at times give them back ordinary feed. Just think of that happening with us humans. It’s affecting our neurochemistry. And stress all comes in the beginning from a stress response that’s your flight or fight mode. And it’s triggered by you feeling threatened or challenged. And as soon as that happens, it increases your heart rate, your blood pressure, your whole body starts to change. And you just look at all the indicators about stress in general. We’re losing the battle on stress here in this great nation. All indicators show that we’re losing. We’re a 24-7 nation. We’re all on the go. And heart disease is up, cancer is up, strokes are up and mind conditions are. And genetic engineered foods are a bit like processed foods. Everybody thought that they were okay for us, but they’re not. They affect your neurochemistry. That’s what’s contributing to us developing very serious addictions, all to do with your neurochemistry because we’re getting uptight so we have to reach for a quick dopamine fix, a dopamine highjack. So you reach for the alcohol, the cigarette, the corn syrup laden sweets or whatever. Or the sodas that we drink and that’s affecting you, that’s affecting your mood. So if you’ve got anymore symptoms of stress, you need to be more proactive. You need to have more good mood foods, more natural foods, just try and stick to the basics. And if you are into CRAP, have it strict moderation. Jason Hartman: And what is the CRAP acronym again? What does that stand for? Paul Huljich: Caffeine, Refined Sugar, Alcohol, and Processes foods. Jason Hartman: Yeah, good stuff to avoid definitely. What else would you like people to know? And of course give out your website as well. Paul Huljich: I think what’s important is to understand and realize that you’re not alone, you’re worth it, have hope, and never give up. That prevention is the key. Prevention is far better than recovery and that unchecked stress has very real consequences, and that you need to take control of your stress before it takes control of you. Jason Hartman: Very good advice Paul. What is your website? Paul Huljich: The website is stresspandemic.com. And I mentioned earlier, the book is available from coast to coast at all leading bookstores and my name is Paul Huljich. You can always go to PaulHuljich.com. Jason Hartman: And that is a fantastic site. Just looking at those pictures on PaulHuljich.com will make one feel better and reduce their stress level I would say. It’s a gorgeous website. Well, Paul Huljich thank you so much for joining us today. Paul Huljich: Well thank you very much for the opportunity Jason. And all of you have a fantastic day, and take that first step and go out there and buy Stress Pandemic. You’re worth it.